Majority of players agree that the Under Armour Magnetico Pro Firm Ground is exceptionally comfortable right out of the box. The upper felt like a second-skin on feet. Most footballers felt that this boot has a clean, close-to-skin touch on the ball. The soleplate of this football boot is flexible, as mentioned by some users. A few players appreciate the clean and streamlined aesthetic of this football boot. The Under Armour Magnetico Pro FG has a snug fit that does not squeeze the foot, based on one expert reviewer. A handful of users observed that the upper of the Under Armour Magnetico Pro Firm Ground does not have a padded sensation, especially when striking the ball. Some players are worried that the upper of this football boot might become too thin over time and can affect its durability in the long run. An expert reviewer cited that this football boot is not as lightweight as he expected. The Under Armour Magnetico Pro Firm Ground has a comfortable fit. The extremely thin upper of this football boot affords a close-to-skin touch on the ball. Its launch colorway also did not fail to please some footballers making them look forward to the shoe’s future colorways. However, some skeptic reviewers doubt the durability of the thin upper, which is also said to not provide enough padding and protection. Despite this, the UA Magnetico Pro Firm Ground is still regarded as among the best and most comfortable boots of 2018. Under Armour is a relative newbie in the football space. They’re an American brand that got their breakthrough doing sweat-wicking apparel and have mostly focused on US-based sports like American football and basketball. Their minor incursions into football have set up a small following for their boots, namely the Speedform and Clutchfit, which are marketed as speed and control boots respectively. They don’t get a lot of publicity due to a lack of key player endorsements and marketing spend in a marketplace that is dominated by Nike, Adidas, and Puma. However, they do have a cult following and the Clutchfit has garnered decent reviews, despite me thinking that none of their boots look particularly great. The Clutchfit has now been revamped into the much more radical Magnetico and I’m here to see what it’s all about. Can an upper be that thin? As a control boot, Under Armour sought out to create a boot that helps you get a great barefoot touch and a comfortable fit. What caught everyone by surprise was how literal they were in the claims to be as “barefoot” as possible. Under Armour produced a paper thin synthetic upper to wrap the forefoot. Out of the box, you can see creases in the forefoot which also struggles to keep its shape due to its debatable structural integrity. The light upper also ensures that it’s a very light boot for a control boot, coming in at about 205g. Out of the box, the Magnetico does not feel like a premium, top grade boot. The stitching at the bottom of the lace area and the heel counter looks poor. The tongue is thin and flimsy and the synthetic upper feels like an upper for a third grade Nike model with a bare inner lining, to say the least. Its saving grace, from an optics perspective, is the soleplate. The top-grade version, the Magnetico Pro has its soleplate come with a sweet metallic finish. Sure, it’ll chip off after a few games but it looks stellar out of the box. After a few plays, I have to say that the paint job is more durable than other boots that carry a wearable finish, with only minimal chipping evident to the eye. After much hesitation, I decided it was time to put the boot on and what I felt blew my mind. The first thing I noticed was how roomy the forefoot is. I had to go down half a size to get the right fit. The boot was soft and broken in from the start. It felt natural, non-restrictive and was like an extension of my body. The upper on the midfoot area is also relatively thin (though nowhere near as paper-like as the forefoot) which made any lateral movements feel free. I also noticed that the boot hugged me around the Achilles area very snugly, almost pinching it. I feared that it would have resulted in blisters once I started playing in them but surprisingly, there was no discomfort and lockdown was superb. There was a time during my childhood where I played football barefoot with my friends. That’s where you hone the technical skills by having a true feel of the boot’s every curve, bump, and texture. The Magnetico made me feel like a kid again. It got the thinnest upper I’ve ever worn on any boot and I’d put a wager that it could be among the top 3 thinnest boots ever made. I had to get used to the touch again as I have been used to wearing padded leather and knitted uppers. It’s a sensation you have to get used to again but I’m sure it’ll be like riding a bicycle – your body just takes over from there. Forget the Control skin strips on the Adidas Predator 18.1 or the heavily textured Flyknit on the Nike PhantomVSN, the Magnetico ensures that it’s just you and the ball. No frills, no textured support. Looking to strike a knuckleball? Well, I can assure you that you can literally see your knuckles protrude when you curl your toes. However, this novelty comes with a big downside. Any tackle that ends up with studs on your foot is going to result in some major pain. After my first incident, I didn’t feel so “free” anymore and I pulled out from tackles from fear of further bruising or injury. Against more cynical opposition, you might even be the target of such nasty tackles so I’d recommend you be really fast in them to skip past opposition legs. I was drawn in very quickly to the insole which looked nothing like I’ve seen in football boots. It’s made up of a memory foam called “Charged Cushioning”. To the touch, it’s quite foamy and provides a bit of friction to keep your feet in place. It’s also very comfortable when you’re running in them, reducing any stud pressure when I played on harder artificial turf grounds. If there’s one thing the big brands could learn from the Magnetico, it’s the memory foam insole. Most brands want to deliver a plush insole with a fabric layer on top for a more premium feel but I’d take this memory foam over other generic insoles any day. The soleplate features mostly conical studs, with 1 bladed stud appearing in the middle of the forefoot. They’ve ensured that there are 9 studs in the forefoot instead of the usual 7, possibly to distribute weight on the artificial ground. It does its job very well. It was easy to maneuver when attempting quick turns and it provided a moderate amount of traction for sprints. Overall, I think the Magnetico performs surprisingly well despite how it looks. The lockdown is fantastic. The boot feels natural and soft and ball control is not a problem. It works well on both firm natural ground and artificial ground. That firm memory foam insole should be the gold standard adopted by the industry. However, one cannot look past the super thin upper to see that they have a big PR issue to manage. Many of my peers were equally fascinated and turned off in equal measure by the thin upper. The upper is a big talking point but ends up leaving people skeptical of its durability and lack of protection. Also, the boot is priced on par with its illustrious competitors such as the Adidas Predator 18.1. It’s hard to justify buying the Under Armour Magnetico at that price due to its poor build quality (at least to the eye) and concerns with the thin upper. Under Armour would be wise to reduce the price point to woo customers to make the switch amidst the aforementioned skepticism. More marketing is required to convince customers of that upper and turn a negative into an absolute positive. Despite its flaws, I believe these boots are a step in the right direction for Under Armour who has convinced me that they can produce a good product. If they improved their build quality and marketing and reduce their price point a little, I think Under Armour can claw its way into the football scene slowly and surely. This is the softest synthetic I’ve ever felt on any shoe. On feet, these are extremely impressive. The best way to describe them is it feels like wearing a well-worn, high-quality leather shoe. The upper is that soft, flexible, and form-fitting to your foot. The shoe has a true barefoot feel but no protection. It has a snug feet, but doesn’t feel like they’re squeezing your foot. If you want a shoe that disappears on your feet while you’re wearing it, go for the Magnetico. It feels like the thinnest leather possible but with none of the extra padding. The Magnetico keeps some of the Clutchfit DNA in that it's built for comfort and control – the cushioning footbed absorbs impact, and the new FormTrue upper forms instantly to the foot for a snug fit. No issues here. Smart stuff. The Under Armour Magnetico Pro Firm Ground was Under Armour’s entry for the 2018 World Cup season. It is a tech-packed football boot disguised in an old-school silhouette. Some may even call it the fourth installment of the Clutchfit series. Although it has several features that may remind users of the Clutchfit football boots, the Magnetico Pro Firm Ground is no-doubt a class of its own. The Magnetico Pro FG features the FormTrue technology, which is an internal upper material that enhances the responsiveness and lockdown of the shoe. It also allows the Under Armour Magnetico Pro Firm Ground to mimic the softness of natural leather while providing the durability of synthetic as the same time. Underneath the FormTrue layer is the ClutchFit technology. This innovation is composed of a layer of auxetic material that is flexible and molds to the shape of the foot. Thereby, allowing the shoe to have a glove-like fit. Amazingly, the toe box of this football boot is very soft. It is designed to adapt to the shape of the foot instantly. The result is a custom fit and barefoot touch on the ball. A highly responsive cushioning system, called the Charged Cushioning, is present on this football boot. It is a special foam that absorbs impact as the foot strikes the ground. It then converts it into energy bursts for better push offs. The innovative soleplate of the Under Armour Magnetico Pro Firm Ground features the Optimal Traction System. It is made up of conical and bladed studs that are strategically combined. With the Optimal Traction System, the player can change directions quickly and still have a good grip of the ground. The Under Armour Magnetico Pro Firm Ground is available in size 7 to 13 for men only. The presence of the FormTrue technology on the upper allows this football boot to accommodate almost anyone with narrow to slightly wide feet. It has a comfortably snug fit without being overly tight. The soleplate of the Under Armour Magnetico Pro Firm Ground is made of a lightweight and flexible chassis. It allows the shoe to follow the natural movements of the foot when flexing and accelerating. 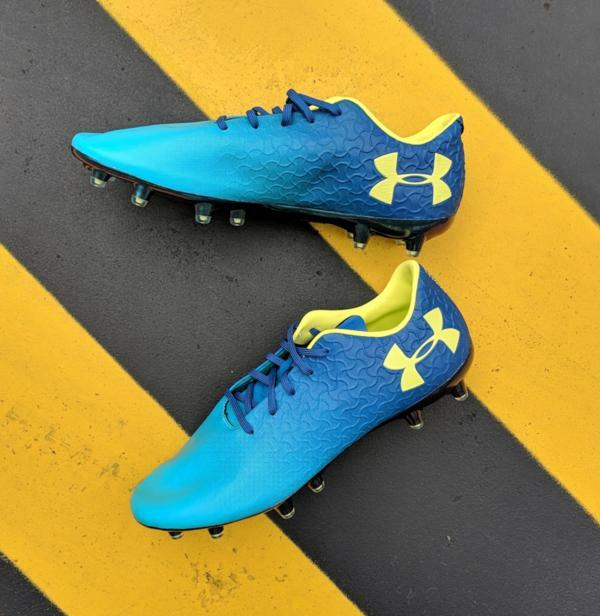 The eye-catching metal finish on the soleplate is a carry-over feature from the Under Armour ClutchFit 3.0 model. This football boot has an Optical Traction System, which is composed of a strategic blend of rounded and bladed studs for optimum grip on firm grounds (FG). There are 12 conical studs and one support stud at the center of the forefoot. These cleats improve the player’s agility and ability to make quick directional changes. The upper of the Under Armour Magnetico Pro Firm Ground has a three-layer construction, which includes the FormTrue technology, the ClutchFit webbing, and the internal lining. On the surface of the upper, this football boot features the innovative FormTrue technology. It is a synthetic material that copies the general texture and softness of a high-quality, broken-in leather. Thus, the Under Armour Magnetico Pro Firm Ground provides a very soft and comfortable fit from the first time it is worn. Underneath the FormTrue material is the ClutchFit, Under Armour’s signature compression technology. It is a specially built material that stretches and expands under pressure, and contracts while the foot is at rest. With this innovation, the Under Armour Magnetico Pro Firm Ground provides a somewhat customized, second-skin fit and feel. This football boot has a Charged Cushioning footbed. It is made of two layers of compressed foam. With the additional cushioning from this technology, the UA Magnetico Pro FG absorbs more impact and converts it into responsive bursts of energy. The Magnetico Pro Firm Ground comes with a central lacing system. It has a traditional tongue with a lace guard to keep it from moving side to side. The tongue also has a memory foam to prevent lace bites. The Under Armour Magnetico Pro Firm Ground can be personalized for a minimal fee. The metallic soleplate will wear off over time.